Throughout early fall, columns of gnomes guarded an entrance to campus. Their white plaster bodies resembled miniature, rifle-toting members of the Ku Klux Klan. Later, in that same place, ruins of a flooded city blazed into the night on College Hill—blues, yellows, and reds shining beneath graffiti about death, community, and development. And you might have missed all of it. In fairness, it was easy to miss. It’s an installation at gardeHouse, Lafayette’s newest art venue. Even if you’ve visited Lafayette 100 times, you might not have noticed gardeHouse. 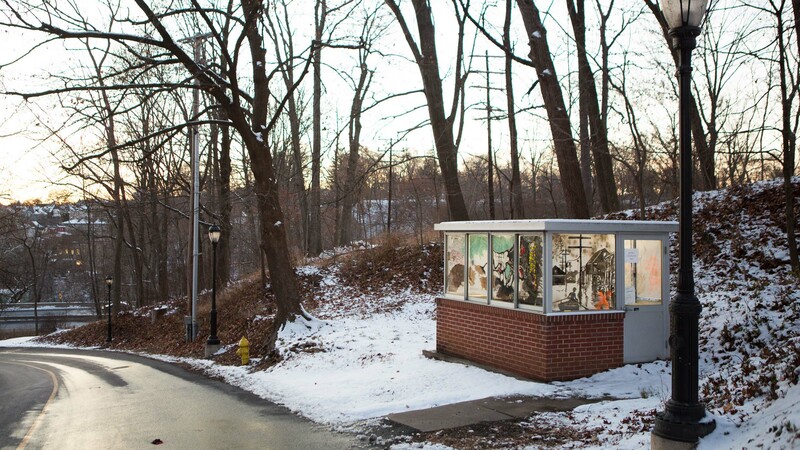 Positioned across Sullivan Trail from Fisher Hall West, it is a squat metal, brick, and glass box, lit by a solitary bulb in the ceiling. The College built it in 2005, about the time it was finishing dorms on the southwestern corner of campus. At that point, the thought was security—the new Lafayette dorms were somewhat isolated from the rest of campus, and some considered students who would live in Fisher Hall might feel safer with a guard there. But the guard never materialized, and the tiny shack sat vacant for years, unnamed and forgotten. Then, one day, it spoke to Nestor Gil. Gil decided to reinvent the unused guardhouse as gardeHouse. Get it? A house for the avant-garde. A place for artists. 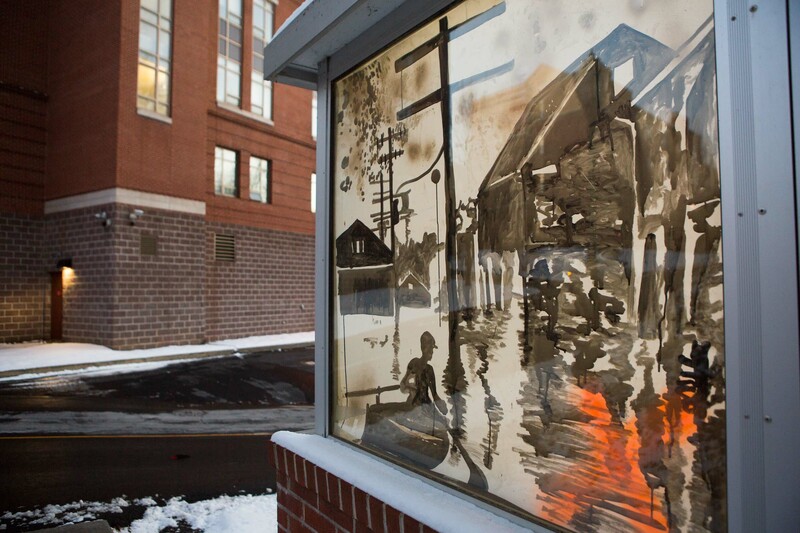 Last spring, the first installation, by artist Julia Buntaine, appeared there. This fall saw the display of new work by Frederick Wright Jones, a professor at nearby Muhlenberg College. Jones called his display Wieder Gross. 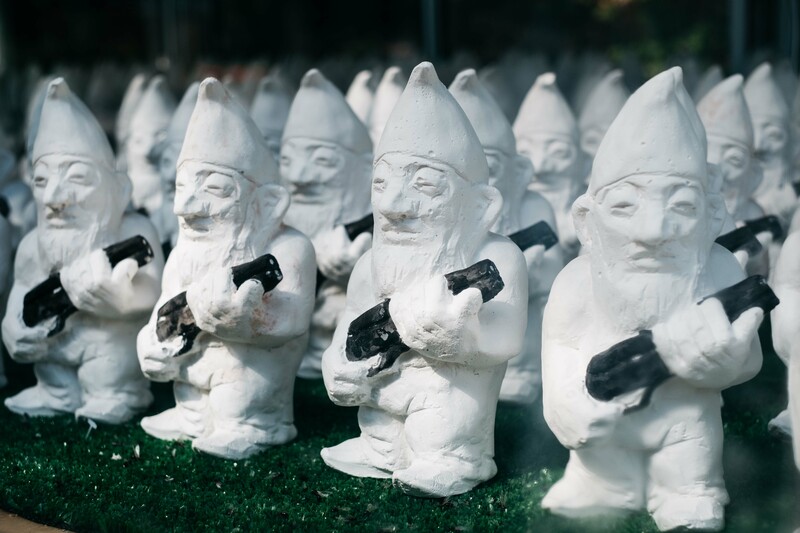 It included 306 white plaster garden gnomes with black guns. The gnomes were installed in 13 rows on a lawn-effect carpet. “It combines security with defensiveness and a need for a scapegoat to pin the precariousness of life itself upon,” read a typed description posted on a sheet of paper attached to the structure. The gnomes remained on display until November. By then, Gil had a list of artists who were interested in using the space. Recently, Ghen Zando-Dennis, professor of media arts in School of Contemporary Art at Ramapo College in Mahwah, N.J., added a display to gardeHouse. It’s called Something Bright Then Through the Golden Holes—a site-specific installation that is rendered in India, walnut, and sumi inks, and spray paint on clear vellum. The drawings are maps of industrial waterways in New Orleans. They make reference to the trajectories of flow and flooding of wetlands surrounding the city and neighborhoods most affected by Hurricane Katrina. A single representational drawing was taken from a still image from an archive film of the Mississippi River flood of 1927. At night, halogen light fills gardeHouse and projects through the drawings. The art represents the Trump administration’s lack of regard for environmental protection and racial injustice, and the intersection of the two. The work will continue to display at gardeHouse through the end of January. Then, other artists will feature their work in the space.